← When Should You Start Looking for Holiday Seasonal Work? 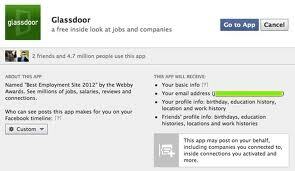 What is Glassdoor on Facebook and Should You Try It? A friend recently invited me to join Glassdoor, a new app on Facebook that sends job postings to members, as nearly as I can tell about it’s function. You also can search for jobs and complete a profile to let people know you’re searching. Glassdoor bills itself as “An Inside Look at Jobs and Companies,” and includes company ratings, presumably by employees. I’m not actively looking right now (although I do believe in my mantra of “Always Be Job Hunting,” so I’d say I’m passively looking at the moment). But I have been searching for places for my graphic designer daughter to apply for a new position, one that would allow her to work in an office environment rather than remotely and out of her home as she does now. So I’ve put in a graphic designer search to test Glassdoor and have received some listings I’m not getting from Indeed.com and other sources I check regularly. For that reason, I’d say try it to broaden your circle of leads. I’ll continue to explore it and let you know what I find, please post your own comments here if you have tried it. This entry was posted in job hunting, Job search tips, Uncategorized and tagged Always Be Job Hunting, First job, job hunting, new job, search tips. Bookmark the permalink. 1 Response to What is Glassdoor on Facebook and Should You Try It?